I'm sure all of you have items that you, unfortunate as it is to realize such, can only ever really dream about finding. You hope and pray that you could find one, and lose sleep over how you don't have one for your specialty collection, but the chances are just so minimal that it could never happen. But you know it could. That slightest possibility still exists. Being our first ever privy dig, Kyle and I were pretty much psyched, excited, unprepared, and confused all as one jumbled emotion that inspired sheer glee as soon as we thought about it. Actually, we can't really say it was a "privy dig" so much as just a "down-town" dig. Still, we had little to no idea what we were doing - our knowledge was limited to the fact that the house in question had been, faithfully to its owners, standing there for 130 years, over the course of which the lot size had not changed, and we had permission to go crazy tearing up holes in the lawn until we got our "groove" on. I dropped off our equipment the night before at the newly acquired residence of my older brother Brent's house, quickly eyed the depressions and bare spots in the lawn at the back of the house, and the paint-chip and brick filled yellow brick-lined cistern, still open along the back wall of the house, and then went inside to have some preliminary fun. After spending a few hours with my older brother, swapping yarns and sharing a drink (of water) and a laugh about how he thought it was ridiculous that we could find something old in his backyard, he gave me a ride over to Kyle's hockey practice. From there I watched him tackle several unsuspecting victims (this story IS going somewhere), and then proceeded to his house to map out our plans. We decided we'd rise at 8:00, and head over to Brent's house to probe. We'd start in the very back corner first, and work our way along the back fence. When we arrived the next morning, Brent was already up, and seemed amused as ever that we expected to find something buried in his lawn. He offered to buy us some coffee, and then headed inside for a while, leaving us to do our thing. We grabbed the probes. I probed a few spots, and continued to hit a layer that felt like gravel or... hmm... maybe something better? I dug a few holes with the post hole digger in a depression, but found nothing better than dark soil. Kyle, on the other hand, was about 8 feet to my left, and probing farther towards the house along the side fence line. He told me he felt something promising over that way, so we decided the time would be well spent there. I cut a chunk of sod out (though my brother's lawn is all dirt and twitch grass, so it just fell into dirt; this is why he didn't care if we dug), and grabbed the post hole digger. Digging down, things felt ordinary, but upon pulling one load of dirt out of the 2' deep hole, a chunk of salt-glazed crock popped out! We were ecstatic! A good sign! Kyle then tells me to stop, quite suddenly, and bends down to the edge of the hole. He plunges his hand in, and out of his mouth comes this remark: "Barrett - right now, I have my finger inside of a bottle!" I was confused out of my mind, but then I realized what he meant, that a bottle had poked it's way into the path of the post hole digger. I, having dug what I have in my life, naturally assumed it would be a 1950s piece, or something else I'm used to. The excitement, therefore, was 100%, but at the same time, my hopes weren't up. So, Kyle let me plunge my arm in to get a feel. Right away, running my finger along the edge of the glass piece, I could tell it was broken, somewhere around the lower part of the lip. I told Kyle as such, and then pulled it out of it's cavern. I suddenly held up the most beautiful sight my eyes had ever beheld: an amber bottle with heavy mineral damage, and thick, old embossing on the front half. I yelped out: "It has embossing! ", and Kyle grabbed it, only to suddenly stagger backwards, placing his hand on his forehead in a text book example of sheer astonishment. "It's a Bixel!" he shouted out. "It's amber, d00d!" I shouted back. "It's amber?" he mumbled as his eyes grew wider. "It's amber! Oh my god, an amber Bixel." 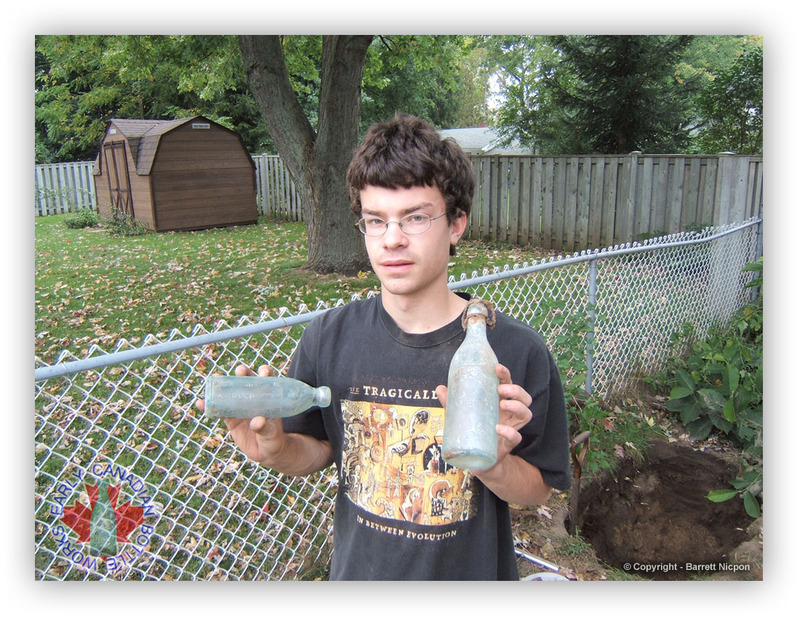 Through this astonishing display at having found one of the rarest of the Strathroy, Ontario bottles, we completely forgot that the piece was broken off at the lip. "It's broken!" Kyle then shouted, suddenly returning to reality. 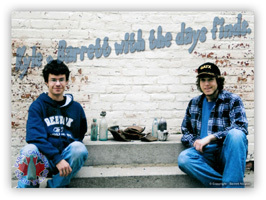 "It's still an amber Bixel, man," I said, "where there's one, there's bound to be more." So, we resumed digging, and, through sifting the discarded dirt, we managed to find two pieces of the Bixel's top - enough to indicate that it was an applied blob top piece. I seem to recall the Matthew Bixel brewery opened in Strathroy in the early 1870s, and I believe this is the earliest generation bottle made by the company. 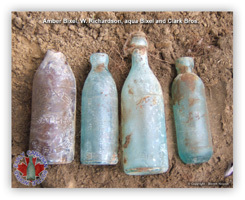 The Bixels in this style are not common period, even in aqua - but there are quite a few more aqua pieces around than ambers. The ambers are believe to be about 7 of a kind. So, we, naturally awed by this amazing find, proceeded to widen the hole. Kyle ran inside to show Brent, and to get the key to the garage for more tarps and an extra shovel. Brent, playing at his computer, remarked "You actually found that in my backyard?" Kyle remarked "Yes..." and then told him what it was worth, how old it was, and how many are known to exist - Brent just laughed. After digging for about 5 minutes, and pulling out a few more pieces of the salt-glazed crock, an old teacup, and a few pieces of metal, I hit glass! By this point in time, Kyle had returned from getting the shovel in the garage - just in time to see me pull our first ever hutchinson out of the ground. At first, we could only see one side, and we naturally assumed it would be a common piece. Turning it over, though, Kyle almost soiled himself upon seeing that it was also a local bottle - a W.RICHARDSON / STRATHROY hutchinson. It, being our second bottle out of the hole, was in spotlessly mint condition, other than the usual mineral damage. We also realized that the gravitating stopper was still in place in the neck, and in nearly perfect condition, as well. The soil here must not have been too moist. Kyle suddenly demanded that I "get the hell out of that hole", and let him dig. I agreed, already having found enough in one day to make my head spin! So, he swapped me the keys to the garage for the shovel, and hopped in. I ran back into the house carrying my W.RICHARDSON to show Brent, and give his key back. Brent just shook his head. As soon as I came back to the door to put my boots on, Kyle was in my face holding another hutchinson - this time a CLARKE BROS / TORONTO piece - also with a flawless gravitating stopper, and a large "C" on the base. He said he had dug it only seconds after I had left, and just inches from where the W.RICHARDSON was. I just laughed, and gleefully ran back towards the hole to watch Kyle dig, and so he did. He dug in the direction of the back corner, parallel to the fence, and continued to pull pieces of crock out. All of a sudden, we hit brick. It was lining the hole along the side wall, and the back wall, but the bricks seemed to have been placed in no particular order - just in a crudely formed line. Mortar was present, though - so obviously some kind of privy was here at one point. After digging for a while, Kyle eventually dug right through the wall, just to see what was there. Strangely enough, pieces of a similar, almost identical crock, and small bottle chunks continued to come out. However, after digging enough crock pieces to assemble 2 or 3 units, he gave up, and let me dig. I decided to dig back the other direction, towards the house, and almost immediately hit glass. This one was a little more difficult to remove, so I had to take my time. It was clearly intact, and quite a bit wider than the hutchinson's - so the piece was a mystery. I then heard Kyle suggest, "I bet you it's a Bixel.". Thinking it foolish at first, I realized that it was a very distinct possibility. That made me think for a minute how incredible this experience was. 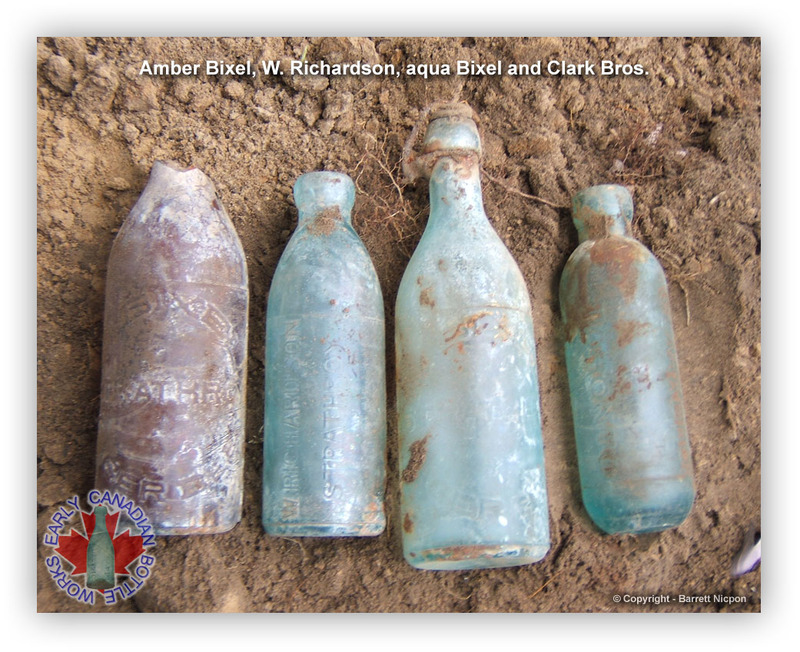 Sure enough, a minute later - M.BIXEL / STRATHROY / LAGER BEER was visible in the dull, beautiful, aqua sheen of 130 year old, mineral-damaged bottle glass. This piece still had the metal clamp top intact on it. Kyle quite literally soiled himself this time. Just kidding. So, the spirits were high, and the bottles were there - we just had to find them. And...We didn't. Nothing, other than broken crocks and small pieces of bottle glass, a broken lamp, and buttons from sifting the dirt came out after that. We realized after 2 hours of vain digging that we had been digging back, rather than down from where the bottles had been, and just as we were getting ready to do so, my parents showed us up, to tell us we had to leave in a little while. We broke digging rule #1, because Brent said we could leave the holes open for as long as we needed. I owe him big time now. After all that, digging up his yard, dirtying the floor in his house, and leaving tarps heaped with dirt sitting around the yard, he still bought us pizza, refused to let us pay, and declined our offer to buy him a 28 pack of Canadian beer. He's among the funniest, most mellow, coolest, and, as it turns out, kindest people you'll ever meet. We will buy him a 28 pack, though. He can't stop us. So, Kyle and I set a date for the near future (i.e.. the day after), so that the grass doesn't die under those tarps (Brent said he doesn't care about the grass), and then said our goodbyes, after dividing up the finds fairly and happily. He kept the CLARKE BROs, and the intact aqua BIXEL, and I held onto the teacup, the W.RICHARDSON, and the broken amber BIXEL. We will continue to dig that backyard until something else in the way of a trash pit pops up. It was a good day, and an excellent start to the glory of a hopefully long & successful bottle collecting passion. Barrett N.